It’s May – hallelujah! – and depending on where you call home, local strawberries have either arrived or they’re close enough, at least, to ponder the age old bakers’ question: what’s the best way to make a strawberry pie? Seems simple enough on the surface. But faced with a finite window of fresh berry opportunity, us pie makers will fret about things. Things like, do I halve the berries, quarter them, or use them whole? Should I cook them first, or use them fresh? Rhubarb? Top crust, crumb crust, or turn them into a jelled topping for a cheesecake-style pie? So many questions, so little time to play around with every delicious variation. In case you can’t take a weeklong strawberry pie sabbatical to sort out these issues, I’ve taken one for you. The outcome, I believe, is the best strawberry pie recipe I’ve tried in years. Maybe you, too. Let me tell you more. I love a good double crust pie, but my preference for crumb-topped fruit pies is well documented. There’s just something so perfectly balanced, so equitable about a sweet-crunchy top, luscious fruit filling, and a pastry crust. 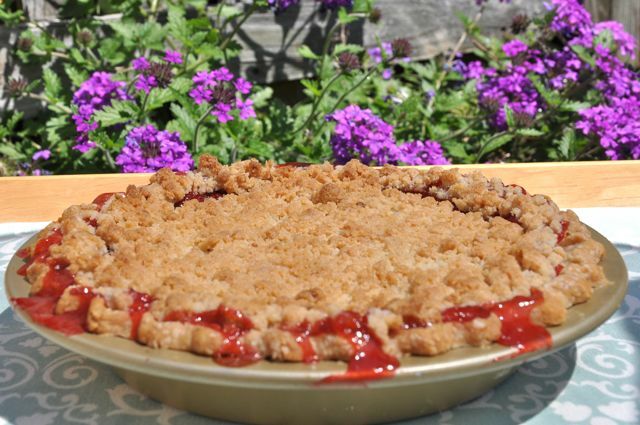 But crumb toppings can be a challenge where juicy berry pies are concerned: bake a crumb topping on a fresh berry filling, and it can easily end up drowning in juice. Soggy crumb topping is bereft of all charm. Precooking the filling with some cornstarch results in a filling that’s semi-jelled, enough to support the topping without swallowing it up. Yes, you essentially wind up cooking the filling twice – once in the saucepan and again in the oven. But I’ve yet to see how this in any way proves detrimental to our lovely berry filling. 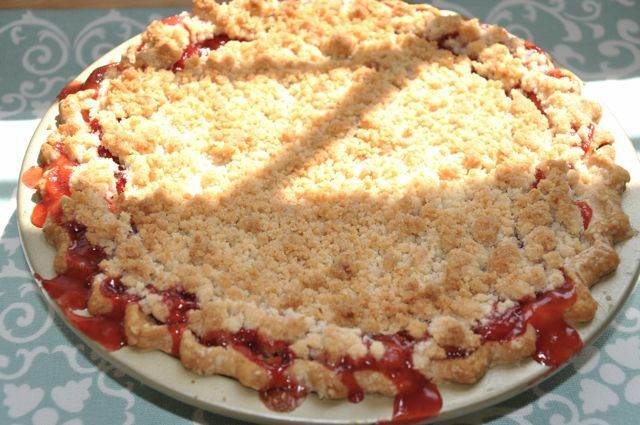 Indeed, since the fruit has been precooked, I find that I can bake the pie at a moderate 350° for the entire time and minimize any over-browning of crust or crumb topping. 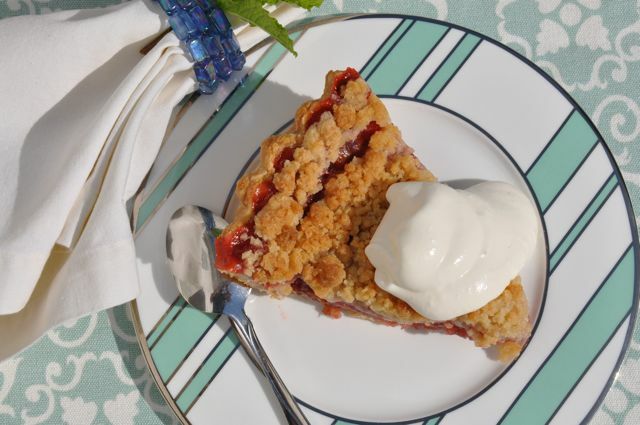 Here’s another trick I’ve stumbled upon: adding not one, but two kinds of thickener to the filling gives me an even “tighter” fruit filling, one that’s firm enough to not run all over creation when the pie is sliced – a common occurrence with juicy strawberry pies. Before the cooked filling goes into the shell I add about 1 1/2 tablespoons finely ground minute tapioca. It’s not meant to replace the cornstarch, just enhance its holding power. I grind the tapioca – in an electric coffee or spice grinder – so the little granules will dissolve and disappear more easily into the filling. If you use them as is, straight from the box, they sometimes form little clumps in the filling. I’ll grind up about half the box of tapioca in one session, then seal it up in a jar and use as needed. It doesn’t need to be ground to a flour-like consistency; fine sand-like will do. 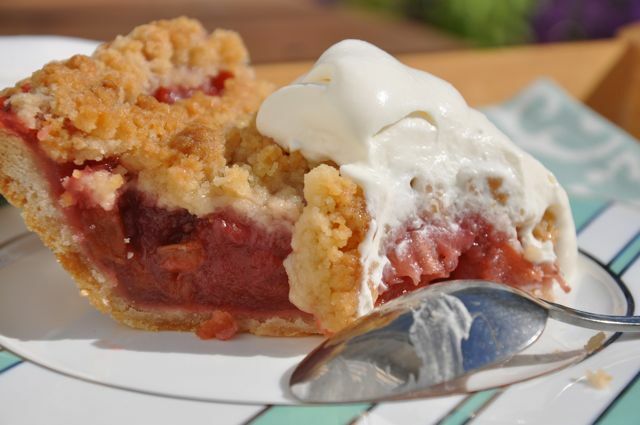 An all-strawberry pie is, of course, an option but I think adding a measure of rhubarb makes sense. 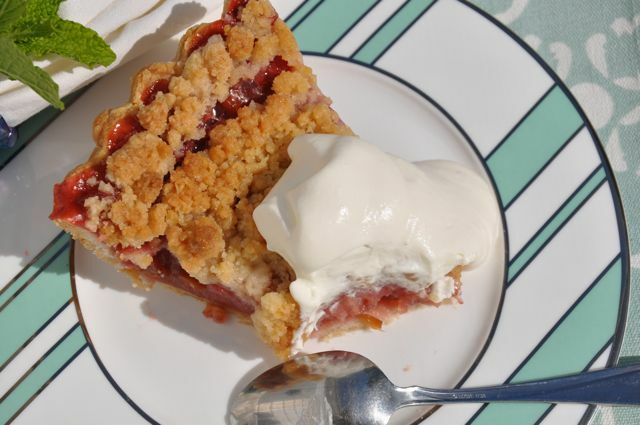 I don’t have strong feelings about rhubarb one way or another, but I consider it something of a civic duty to include it in strawberry pie, if for no other reason than I’m unlikely to use it, otherwise, during the year. 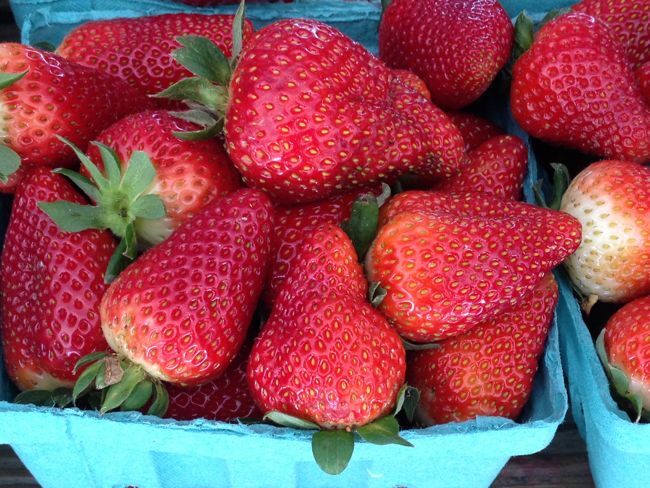 Its mild flavor certainly harmonizes nicely with fresh strawberries, so why not? So there you have it: strawberry-rhubarb pie in a nutshell. It’s not the only way to do it, but I’m pretty certain you’ll find it to your liking. Let me know, ok? It’s always a pleasure to get your emails. Any of my archived pie crust recipes will do just fine here; I’ve listed some of them here, with the links. Summer pie season is fast approaching. Make this your best pie year ever with Ken’s online video training – The No-More-Tears Pie Pastry Course. On a sheet of lightly floured wax paper, parchment paper, or another surface, roll the pastry into a 13-inch circle. Invert the pastry over a 9- to 9 1/2-inch deep-dish pie pan, center it, then gently peel off the paper. Tuck the pastry into the pan, without stretching it. Sculpt the edge into an upstanding ridge and flute the edge. Refrigerate for at least 30 minutes, preferably longer. Prepare the filling: Combine the sugar, cornstarch, and nutmeg in a large, heavy, nonreactive saucepan. Whisk to combine, then whisk in the water. Add the strawberries and rhubarb. Slowly bring to a boil, stirring pretty much nonstop, gradually increasing the heat as you go. After the fruit begins to boil, continue to cook gently, stirring, for about 2 minutes, until thickish. Remove from the heat and transfer to a large bowl. Cool the fruit for 5 minutes, then stir in the lemon juice and zest. Sprinkle on the tapioca, about a third at a time, stirring it thoroughly into the fruit. Set aside while you make the topping. Combine the 1 cup flour flour, sugar, brown sugar, salt, and cinnamon in a large mixing bowl. Mix well by hand. Add the butter. Using a large fork, mix briskly until you have large, clumpy, buttery crumbs. Add the remaining 1 1/2 tablespoons flour, then rub very gently between your fingers to make much finer crumbs. Refrigerate. Preheat the oven to 350°. Transfer the pie to a cooling rack and cool for at least 2 hours before slicing. Makes 8 servings.